We haven't got EFTPOS or PayPal organised yet, because we mainly take 'Bank Transfers', cheques that have had time to clear, cash or bank cheques. When you are ready to place an order, email or call us for our Bank BSB details. Because our product is in such a fluid demand, some customers may miss out if we run out of stock due to unexpected sales rush, so we recommend you secure your order, typically with a refundable $200 or so deposit. Custom-builds require a different arrangement. Click here to have a look at one of our first custom-builds to arrive for a customer getting ready to travel in convoy over the many sand-dunes of Central Australia. freight rates from Perth to the Eastern States. Galaxy Outdoor Campers - travelling dust cover. Click on the picture above to zoom it out! CamperTrailerFinance.com.au, a Queensland based business that caters for customers Australia wide. 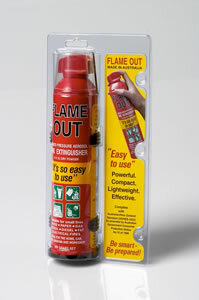 'Flame Out' 500g Dry Powder Aerosol Fire Extinguisher.